View More In Gun Holsters. The Original Jackass Rig" was reintroduced for Galco International’s 30th Anniversary. Galco’s predecessor, "The Famous Jackass Leather Company," first introduced this shoulder system in 1970. 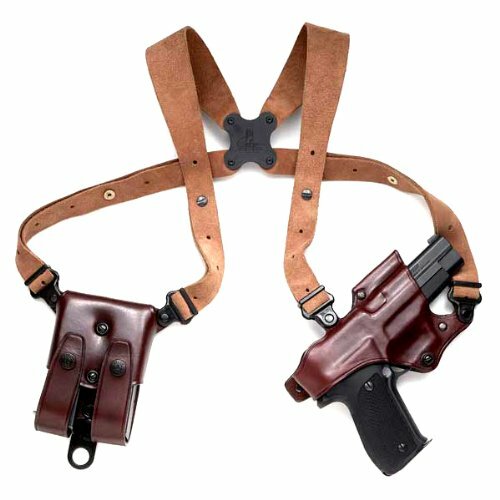 It features a horizontal holster that can be adjusted to a more diagonal carry position than our Miami Classic or MCII, attaching to the harness with our patented swivel connectors. The ammo carrier has a streamlined yet secure design, while the premium Center Cut Steerhide harness provides unparalleled concealment opportunities, greater adjustment and comfort. All four points of the center cut steerhide harness can pivot independently and are connected by our unique clover-shaped Flexalon swivel back plate, which is a Galco trademark. The Jackass Rig includes holster, harness, ammo carrier and a set of system screws. The Jackass Rig is fully modular, and optional accessories and components may be purchased separately. Made for semiautomatic pistols, the Jackass Rig is available in right hand draw in havana brown finish. If you have any questions about this product by Galco Gunleather, contact us by completing and submitting the form below. If you are looking for a specif part number, please include it with your message.